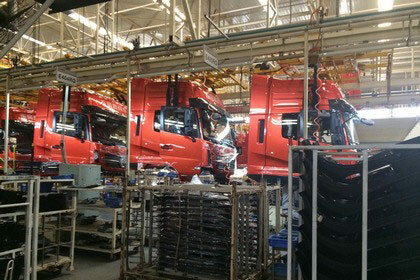 Solution 2 - CipherLab Co., Ltd.
One of the most prestigious automotive companies for heavy-duty vehicles in China runs more than 900 service centers all over the nation. A large variety of replacing parts are required. The service centers fix customers' vehicles at the front line, while the company manages the parts providers for these service centers. All contract suppliers have been proven that their components comply with standards and regulations to ensure customers' safety. However, 90 % of service centers are franchised and the operators rely on paper-based process to collect data. It is very difficult for the company to have a snapshot on the inventory levels in a timely manner. The immediate concern is to manage the efficiency of data entry so as to avoid manipulation of inventory reporting. CipherLab 9700 mobile computer is chosen to facilitate the reform process mainly because of its reliable Wi-Fi connection and versatile usage. CipherLab 9700 mobile computer not only prevents wireless connection from dropping unexpectedly but also is widely used in warehousing environments. The following contents will explain how it works at the service center. When a delivery arrives, a receiving operator uses 9700 scan the barcode on the delivery order form for counting and tagging receiving items. Then, the operator ticks the checkbox list items shown on the screen to confirm the right items and quantities received at the scene. The confirmation data directly transfers to the ERP by Wi-Fi connection and covert the barcodes on the ordering form into the company-defined barcodes for each item and ERP system then begins to send the data back to the device. Once the portable barcode printer has connected with 9700 mobile computer via Bluetooth, the operator prints the desired barcodes out and puts new labels on the received items before they are put away to stock locations. The warehouse operator uses 9700 scan on the barcode of the items to find the storage bin for put away when the items are delivered to the warehouse. After finishing the put away operation in the warehouse, the warehouse operator receives a material request form from a mechanic who has filled out a list of material parts needed for repair in the ERP. The operator scans the barcode on the material request form, the details of the pick list and the bin locations are displayed on the 9700 screen. After gathering the materials, the operator scans the storage bin label and selects the checkbox to confirm the item has been retrieved. The current changes are updated with the latest inventory level from 9700 to ERP through Wi-Fi. The mechanic receives the materials delivered to the repair workshop and scans the barcodes to record parts changes with 9700. After the repairs are completed, 9700 also helps to mark consumed materials and then migrating the changes to the ERP via Wi-Fi. CipherLab 9700 mobile computer accomplishes real-time data synchronization between the device and backend system. Therefore, stock levels can be monitored carefully to trigger replenishing orders only when they are needed. In the meantime, all consumption is clearly recorded in the system to prevent intentional manipulation. All in all, automating a company's workflow offers many benefits, including eliminating work redundancy and minimizing human intervention. CipherLab 9700 mobile computer helps to reduce errors and ensure accurate data wherever possible in receiving dock, warehouse or delivery area. As a result, people are capable of doing more work with less time and fraud prevention is proven to be successful. Along with these advantages, the company finds the effective solution to verify parts authenticity and keep track of inventory levels. It is certainly wise to choose CipherLab 9700 series to safeguard customer's interests and make more profits for business success.